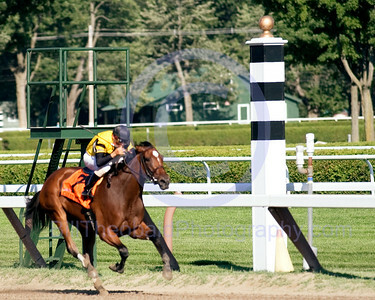 Features action Photographs of Contemporary Thoroughbreds. 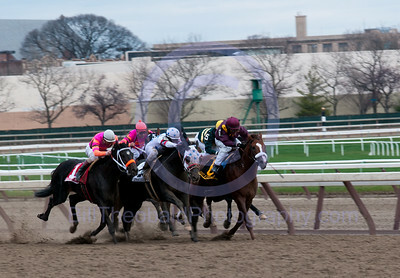 The field for the Hill and Dale Cigar Mile races around the far turn at Aqueduct Race Track. Led by Driven by Success (orange cap) and Vineyard Haven (white cap) followed closely by Bribon (purple) on the outside of the eventual winner Kodiak Kowboy (white and red)followed by Vacation (red) and Pyro (blue). The Cigar Mile is the final Grade 1 race run in New York. Flashing ridden by Rich Migliore strides away from the field after leading every step of the way in the 88th running of the Gazelle. 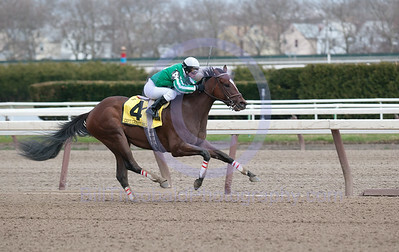 Flashing is a 3 year old filly by A.P. Indy. 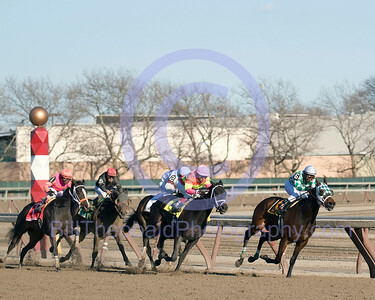 The field for the 88th running of the Gazelle enters the far turn at Aqueduct on November 28. The field in order Falshing, Unrivaled Belle, Bon Jovi Girl, Me Love, Milwaukee Appeal, Stardom Bound, Peach Brew and Multipass. 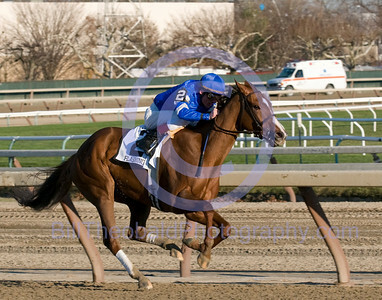 Buddy's Saint and Jose Lezcano cruise down the stretch at Aqueduct during the 96th rendetion of the Remsen Stakes for 2 year old colts. 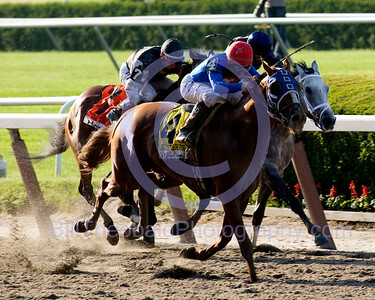 Jose Lezcano sneaks a peek behind him to see if any one is gaining on him and Buddy's Saint shortly after entering the stretch during the 96th running of the Remsen Stakes for 2 year old colts. 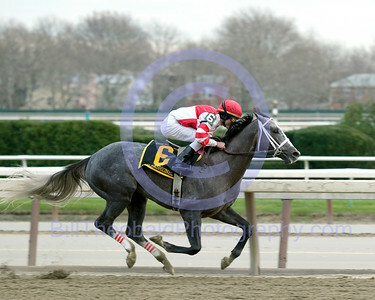 Buddy's Saint won comfortably and established himself as a contender for the derby trail in 2010. Tazahit on the outside launches her bid as she levels out entering the stretch during the 88th running of the Demoiselle Stales for 2 year old filles. 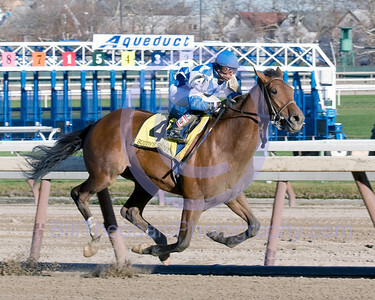 The field for the 88th Demioselle Stakes passes the quater pole at Aqueduct and enters the stretch of Aqueduct. The field is led by Oh Diane closely followed by Tizahit, Fuzzy Britches, Protesting, and In the Rough. Lentenor the son of Dynaformer out of the broodmar La Ville Rouge which makes him a full brother to 2006 Kentucky Derby winner Barbaro. Rachel Alexandra in one of her outstanding performances when she won the Mother Goose Stakes and in the process set a Stakes record. The previous record had been established by the legendary Ruffian. 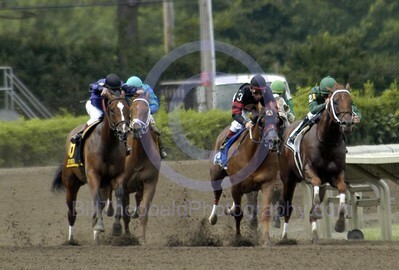 Summer Bird cruises past Mine That Bird and Dunkirk in the late stages of the Belmont Stakes. 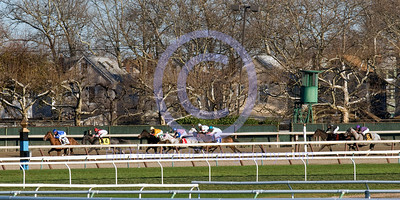 Ain't Love Grand (#2) and Sky Diva (#5) duel down the stretch at Aqueduct during the 2008 rendition of the Demoiselle Stakes during the annual Holiday Festival. The race was won by Spring Side who made a 5 wide bid on the turn and surged by these two horses on her way to a 6 length victory. 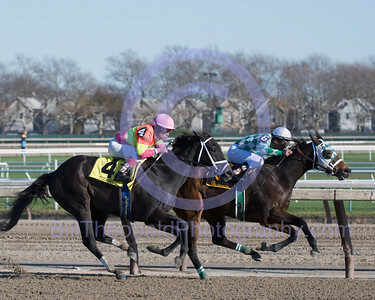 Old Fashioned a son of Unbridled's Song totally dominated the 2008 running of the Remsen Stakes at Aqueduct race track for trainer Larry Jones. Old Fashioned lead almost every step of the way of 9 furlong contest. It was the first time that these two year olds were asked to go that far. The question is Does he have just 1 more furlong in him for the 2009 Kentucky Derby which of course is a mile and a quarter. 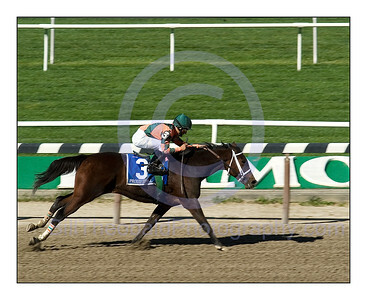 The Green Monkey finally commences his racing career in a Maiden Special Weight at Belmont Park on September 15, 2007. The Green Monkey was the most expensive horse ever purchased at an auction. The gavel stopped the bidding at a reported $16 Million. The Green Monkey finished a well beaten third to a Roi Maudit who was breed by his owners. 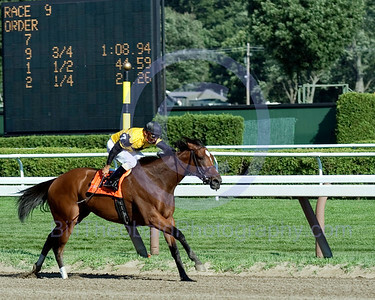 Proud Spell shown here winning the 101st running of The Matron at Belmont Park. 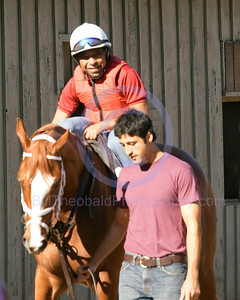 Proud Spell was ridden to victory by Gabriel Saez who made the trip up from Delaware for the ride. Lear's Princess ridden by Eibar Coa passes Rags to Riches and spoils her return to the races in the 112th edition of the Grade I The Gazelle stakes at Belmont Park. 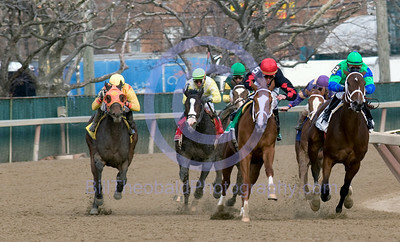 Tale of Ekati ridden by Eibar Coa and saddled by Barclay Tagg draws away from the field in the 118th running of The Futurity at Belmont Park. Tale of Ekati held off the fast charging Kodiak Kowbay after getting by the pace setter Mythical Pegasus on the rail. Hall of Fame jockey Angel Cordero Jr. is on board of Belmont Stakes winner Rags to Riches early in the morning as they preapre for a work out at Saratoga. "Rags" was the first filly in 102 years to win the Test of Champions. 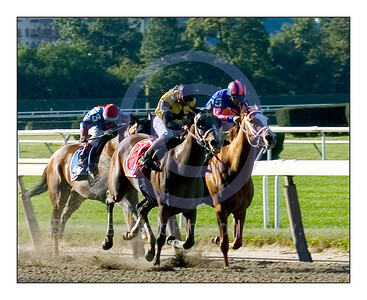 Dream Rush & Eibar Coa pass by the eight pole at Saratoga enroute to victory in the 2007 edition of the Darley Test Stakes at Saratoga. 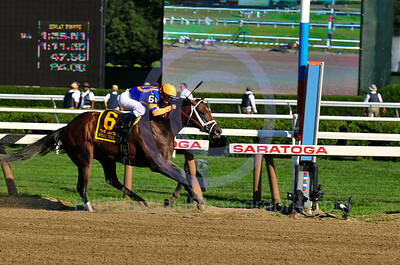 Westpoint Stables Dream Rush on her way to Victory in the Grade I Darley Test Stakes at Saratoga Race Course. 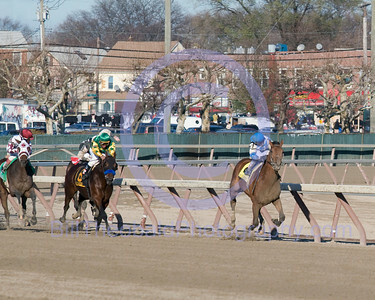 Eibar Coa had her on the lead from gate to wire while setting all of the fractions and nobody was near her at the finish. 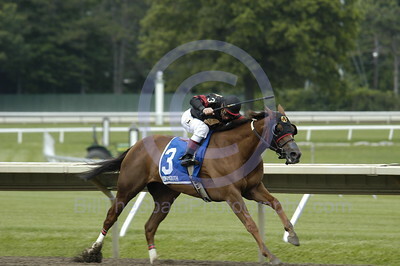 A Stronach Stables horses wins at Monmouth Park, Oceanport, NJ. And Down the Stretch they Come! 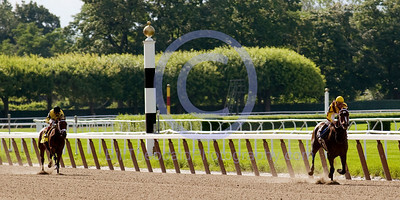 A field of thoroughbreds spins out of the turn at Monmouth Park in Oceanport, New Jersey.